The Communist Youth Union of the Czech Republic strongly reject the decision of the 11th Circuit Court of Appeals in Atlanta, that confirmed the convictions of the Cuban heroes Gerardo Hernández (two life sentences and 15 years of prison) and Rene Gonzáles (15 years of prison). The same judge who has already sentenced them in contradiction to all the international and US laws will revise the „cases“of Ramón Labanino, Fernando González and Antonio Guerrero. We want to inform you about the latest news and developments of the banning of The Communist Youth Union (KSM) of the Czech Republic. On Wednesday March 19th, 2008 a Municipal Court of Prague rejected the administrative protest delivered by the KSM against the decision of the Ministry of Interior of Czech Republic on the dissolution of the Communist Youth Union (KSM). 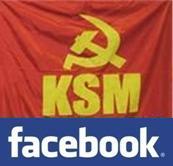 The official reason of the banning of the KSM was declared a programmatic goal of the KSM to replace private ownership of means of production with a collective ownership of means of production. Also the reason for the dissolution of KSM was the convincement of the young people about the necessity to struggle for another society not based on the capitalist principles. 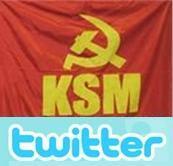 This attack against KSM is a culmination of the long lasting anti-Communist campaign. The administrative protest of KSM rejected! 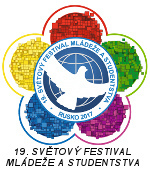 On Thursday, April 24th, 2008 the Communist Youth Union (KSM) received judgement at law of the Municipal Court of Prague, which rejected the administrative protest delivered by the KSM against the decision of the Ministry of Interior of Czech Republic on the dissolution of the Communist Youth Union (KSM). The ban of the KSM by Ministry of Interior was declared as lawfull. Prague, March 10th, 2008: Dear comrades and friends, we want to inform you that on March 19, 2008 at 9:00 in Hybernska street 18 (1st floor) in Prague a trial that shall decide on the legal or illegal status of the Communist Youth Union (KSM) which was banned by the decision of the Ministry of Interior of the Czech Republic in October 2006 will start one year and six months after the KSM filed an action against the decision of the Ministry of Interior and only 3 days before the 8th Congress of the Communist Youth Union (KSM) which shall take place on March 22, 2008 in Prague. The Communist Youth Union (KSM) in the Czech Republic which actively participates in a world wide campaign in defence of the Five Cuban Heroes and which develops its campaign of solidarity with socialist Cuba has organized a demonstration in support of the Five Cuban Heroes jailed in US prisons that took place in front of the embassy of the USA on April 7th, 2007 in Prague, Czech Republic.